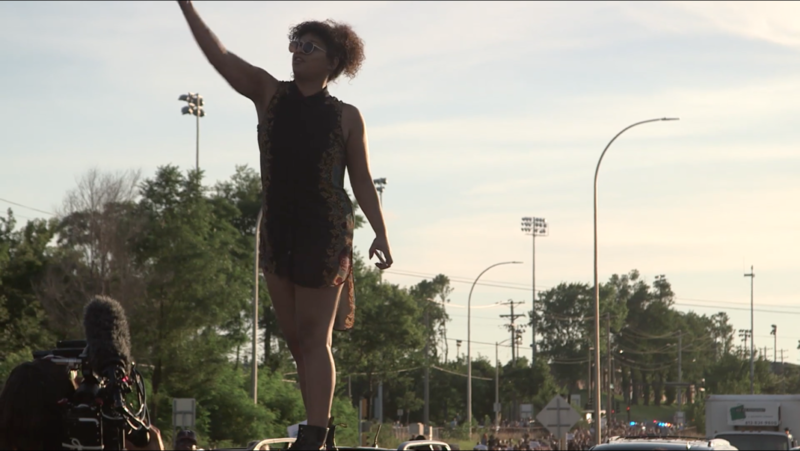 Mica Grimm rallies protesters during the July 9 shutdown of Interstate 94 in St. Paul. In the hours and days after protesters took to Interstate 94 to call attention to the death of Philando Castile, police brutality and a broken system of policing based on white supremacy, the narratives on social media versus the narratives that emerged from the Twin Cities press detailed two different stories. One was a story of mayhem and violence against officers perpetrated by uncooperative agitators. The other was a story about why the protesters were marching, about how the force used by St. Paul Police was disproportionate to any threat the protesters presented, and the irony of a demonstration about police brutality ended in tear gas, flash bombs and arrests. In this Community Voices video, two protesters–Mica Grimm, Alicia Lucio and a protester who only gave his name as “Daquan”–who were on the ground that night share their side of the story. Correction July 20, 2016: This video has been edited to correctly portray protesters who attended the I-94 shutdown. Tears. Anger. It is critical we exercise our constitutional rights. It is critical our children are with us in that walk in the life of education about all things including direct action. Emotion. Tears. Anger.